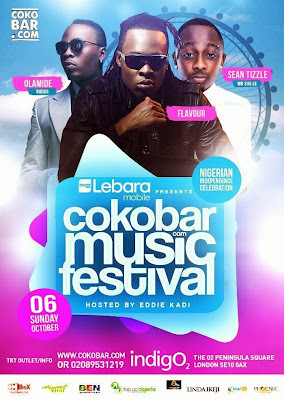 It's Just Mobolaji | Music & Entertainment: Lebara Mobile Presents: Cokobar Music Festival with Flavour, Olamide and Sean Tizzle @ the IndigO2! Lebara Mobile Presents: Cokobar Music Festival with Flavour, Olamide and Sean Tizzle @ the IndigO2! Lebara Mobile and Cokobar.com are gearing up for what is expected to be the biggest Afrobeats show of the year thus far. In honour of Nigerian Independence Day, they're flying in Flavour, Olamide and Sean Tizzle for this one off special show, held at London's IndigO2 this October. Flavour will be performing his hit songs ‘Nwa Baby (Ashawo Remix)’, ‘Adama’, ‘Oyi’ and many more, whilst Olamide will also do the same with his songs ‘Omo to Shan’, ‘Stupid Love’, ‘First of All’ and the latest banger ‘Durosoke’. It'll be Sean Tizzle's first time in the UK and he is set to rock the stage with his club favourite jam - ‘Sho Lee’ and his new songs including ‘Mama Eh’. 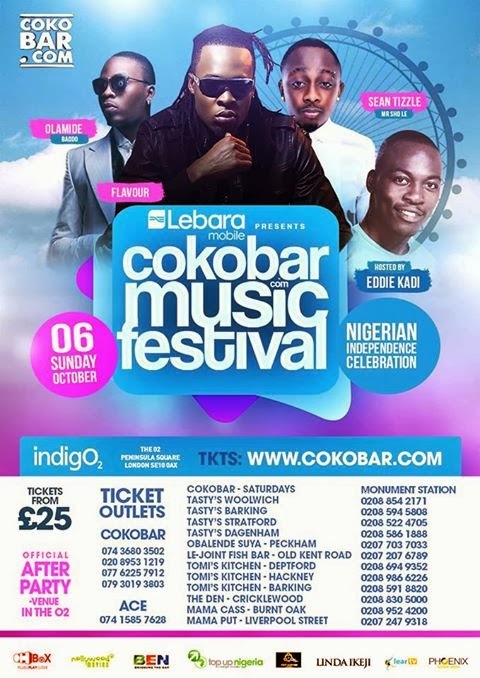 The Cokobar Music Festival will take place at London's IndigO2 on October 6 with comedian Eddie Kadi as the host on the night. Tickets for the Cokobar Music Festival are selling fast, so make sure you get yours as soon as possible. Furthermore details about the show below..
Tickets: are currently priced at £25 for standing, and £50 for VIP (seated). 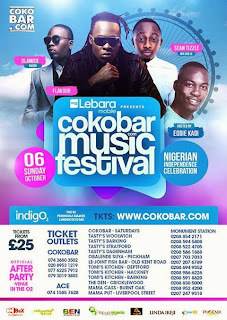 You can purchase your tickets via: www.cokobar.com or call: 07930193803 to have them delivered to your doorstep!